You don’t need me to tell you that the 2014 NBA playoffs will be the most exciting in years. The discrepancy between the East and the West is tremendous in terms of conference quality but within each conference there are great stories…and we know that the Finals are going to be competitive. The main question for me is do I stick with my pre-season playoff picks or pull a 180 on my champion and other rounds results? I did correctly hit 12 of the 16 playoff teams but seeding ended up…a bit off. That is attributable to the incredible parity within the league because there are few clear favorites. 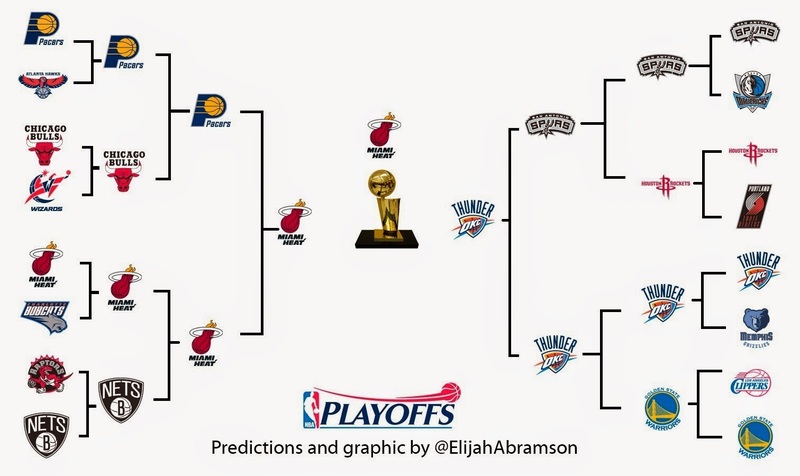 Since there are no clear favorites this year, the NBA paved the way for a few bold predictions on my part. (Comment with your own below.) Bold prediction #1: Kevin Durant will average 40 in one series. KD has been on a well-documented scoring tear for…well, the length of the season. He joined two of the most elite scorers in NBA history, Michael Jordan and Wilt Chamberlain, by leading the league in total scoring for five consecutive years. He’s bound to shred opposing defenses throughout these playoffs, but I see him either a) taking advantage of the Grizzlies in round 1 and putting up 40 a game or b) in the Finals turning it up a notch and going full MJ. Bold prediction #2: no series in the entire playoffs will end in a sweep. The favorite to prove me wrong on this one is Miami over Charlotte, with an outside shot to Chicago shutting down Washington. Joakim Noah and the Bulls truly have an “us against the world” mentality after their front office dealt one of the team’s core players, Luol Deng. They’re even out to prove their own team (management) wrong! But in the end, John Wall and Kemba Walker won’t let it happen. And Dwyane Wade still needs a warm-up series. The final bold prediction will have to wait for one of the below series analyses. It will be worth the wait…and just remember that these are bold predictions. I’m not out here claiming Indiana will beat Atlanta and calling it anything more than a given. Although if Paul George continues his downward spiral, you never know. And at this rate, Roy Hibbert appears to have a better chance rebounding the saliva Frank Vogel spews after another missed box-out than hauling down a basketball from the glass. John Wall is finally here! Like Kyrie Irving, he was one of those guys you looked at and said, “man, why isn’t this guy on a playoff squad?” Well, folks, here he is, battling a ferocious Chicago team that is so good that Brooklyn pulled off the NBA’s first tank-for-a-lower-seed strategy. Although Wall’s FG% leaves much to be desired, his reckless abandon at attacking the rim is something that keeps defenses on their toes. Trevor Ariza might be the most underrated role player in the league, with a respectable 14-6-3, 1.6 steals per game, and a tidy 46-41-77 shooting. Washington will work their wizardry for a couple games but Jimmy Butler and Joakim Noah anchor one of the NBA’s best defenses. It’s nice that Charlotte gets a shot at the playoffs for the second time in franchise history but we all know how this one will end up. The one minor story that will be interesting to watch play out is MKG defending LeBron. We all know Kidd-Gilchrist for some of his facials, but he won’t be throwing down any on LeBron. His defense, on the other hand, will be interesting to watch. As will how Miami defends Al Jefferson in the post. But “interesting” here is relative. Miami wins, 4-1. Kevin Durant is not nice and Kevin Durant has not forgotten. 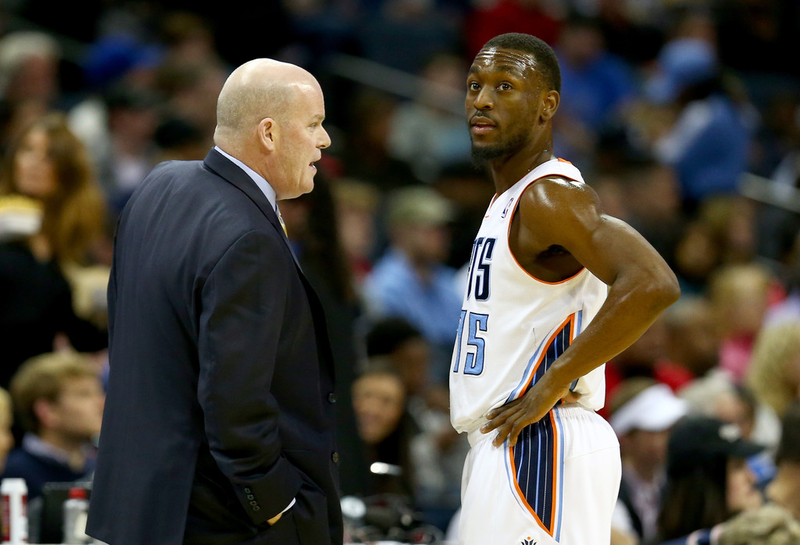 The embarrassment that he underwent in the 2013 NBA playoffs losing to the Grizzlies and his improvement since then is enough to lead OKC to the conference semis. The individual games will be competitive, but Memphis will be lucky to win two games. I would not be surprised if bold prediction #1 comes true in round 1. Oklahoma City wins, 4-1. 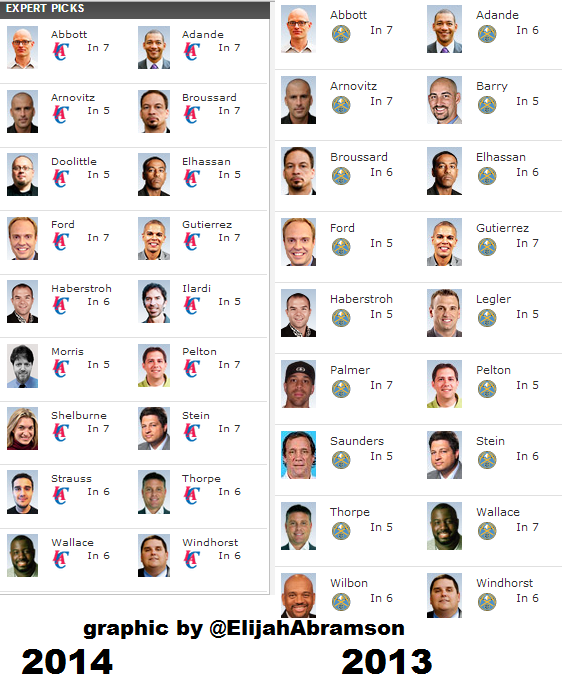 Not a single ESPN writer chose the Warriors to win, which isn’t surprising considering the Clippers have one of the most loaded rosters in the league. But when you remember that not a single ESPN personality picked Golden State to win round 1 in 2013 (and GS won), I have my ammo for your disagreement with this pick. 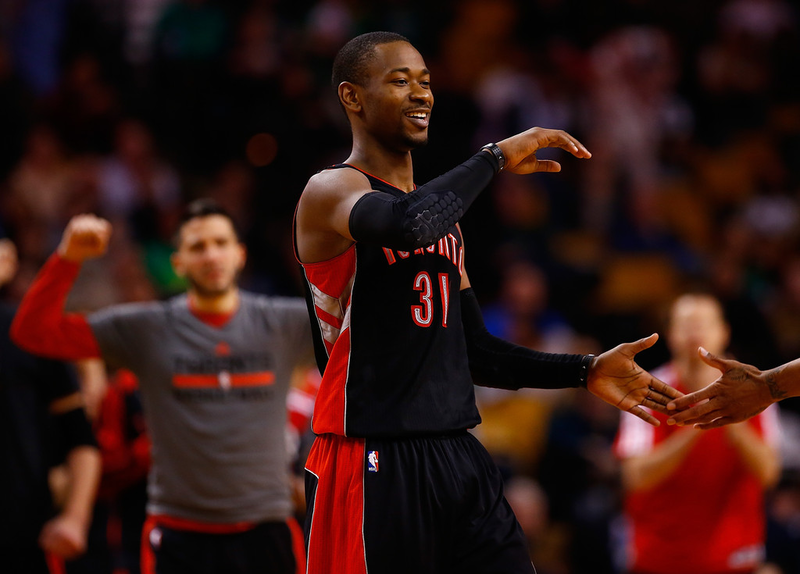 One topic is obvious, though: this series hinges on the battle of the point guards. Bold prediction #3: Steph Curry proves in this series that he is a better point guard than Chris Paul. In the frontcourt, Blake vs. DLee will be fun to watch, too. I’m going to go ahead and place the over-under for fights in this series at 2.5. I’m taking the over. Golden State wins, 4-3. Luck is truly in Indiana’s favor for these playoffs. They should be thanking Brooklyn for the worlds-most-interesting-tank because if this were Brooklyn instead of Chicago, I’d take Brooklyn. Alas, it is not and the reality is that Chicago is a poor-man’s Indiana. Joakim Noah is a contender for NBA Defensive Player of the Year but he doesn’t have the support around him to score…even against an offensively-challenged Indiana team. This series is more likely to have teams score under 80 than above 100. Indiana wins, 4-2. Everybody is salivating over two potential individual matchups this post-season: LeBron vs. Durant and LeBron vs. Paul Pierce. The former would make for the most interesting Finals matchup since Magic Johnson vs. Larry Bird and the latter is the matchup of someone who can be perceived as passive vs. one of the fieriest competitors in the NBA (as a black mamba hisses at me). PP34 and KG are well past their prime and will probably log limited minutes but multiple fourth quarter battles of King James vs. The Truth? Yes, please. Jason Kidd has pulled off a minor miracle with the new Nets but ultimately playing against the best player of the game will be enough to win what would be a very exciting series. Miami wins, 4-3. 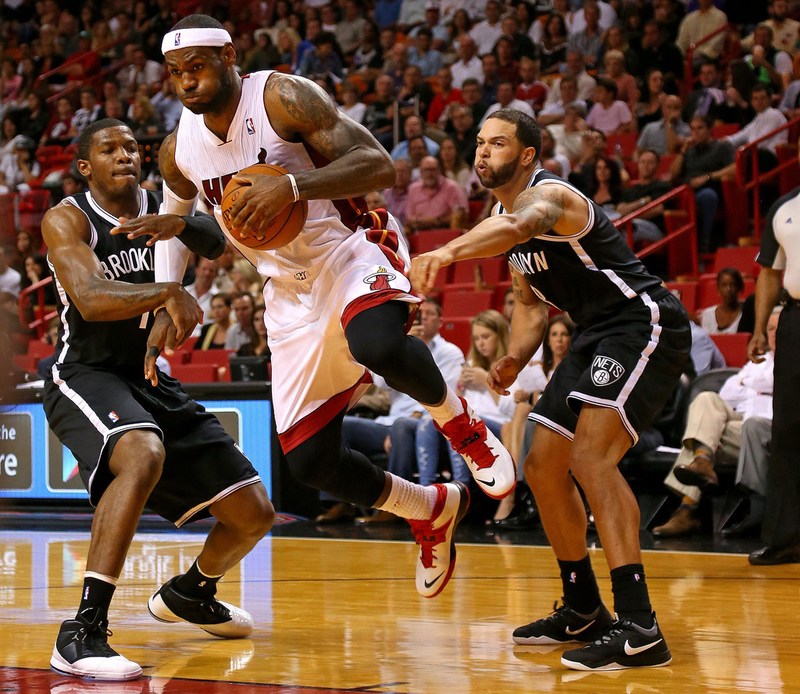 Take a reading break to enjoy the facial expressions on LeBron's and D-Will's faces. Joe's isn't too bad, either. This series is like Toronto vs. Brooklyn 2.0. The young guys vs. the old guys…except San Antonio leaning heavily on Kawhi and OKC leaning (lightly) on Derek Fisher from the bench. Kevin Durant vs. Kawhi Leonard would be yet another heavyweight battle, but this is the year of the Durantula. OKC’s bench does cause some worry in this series because San Antonio with Patty Mills & Co. make up the second-best second unit in basketball (Clippers). Here’s where a bonus prediction comes in. Durant and Westbrook will need someone to help step up in crunch-time because the greats always do as the playoffs wear on. Bold prediction #4: Derek Fisher hits a game-winner in the Western conference finals. And that will be enough to propel OKC over San Antonio. Oklahoma City wins, 4-3. It would take the second time in three years for LeBron James and Kevin Durant to meet in the Finals for this to finally be considered a rivalry. Neither player has a particularly hostile personality but this Finals matchup would certainly change that. 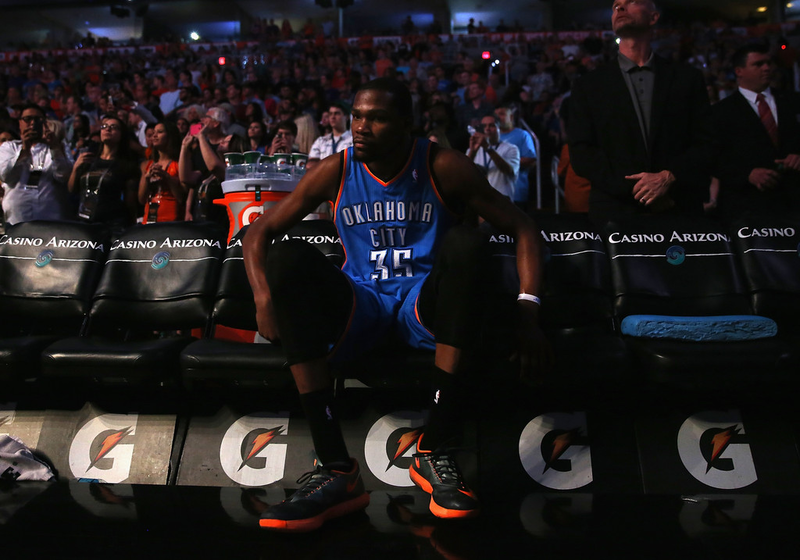 1) Kevin Durant is desperate to prove that he is not the second-best player in the league. A championship would bolster his argument for best in the league, especially against LeBron and the Heat. 2) LeBron knows KD is coming. He feels the doubters questioning his team and knows if Miami doesn’t win this year that there is a chance the team falls apart with Wade’s ailing knees. KD made me question my pre-season pick, but I predicted Miami to win the 2012 and 2013 titles so I’m sticking with them for 2014 and the first three-peat since the 00-02 Lakers. LeBron puts up 30-8-7 and confirms his position as the greatest forward in NBA history with another Finals MVP win. Miami wins the NBA Finals, 4-3.